Cambria is a natural, quartz surfacing product that has a variety of uses in your home or business such as countertops, floor tile, vanities, fireplace surrounds, wet bars, showers, etc. Cambria is pure, natural quartz, one of the hardest and most common minerals on Earth. It has the natural look and feel of granite, but features superior performance because of its strength and durability. It is nonporous and will not absorb food and liquids like granite does. And best of all, it is maintenance-free. BEAUTY – Cambria is available in more than 100 designer colors. These distinct colors boast the natural beauty and variation of quarry cut stone. 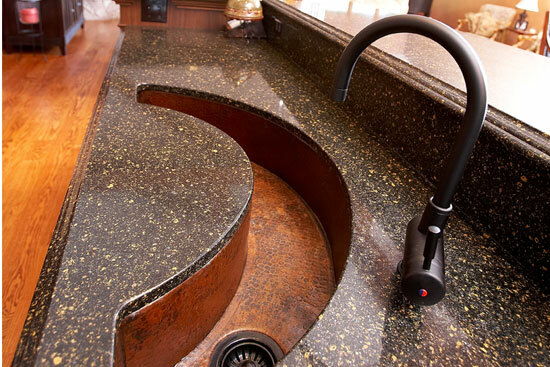 Cambria is the only American company in the quartz surfaces business. Cambria’s color options are also significantly different, reflecting our knowledge and responsiveness to the marketplace. Additionally, Cambria is a family-owned company with more than 60 years of manufacturing experience. Cambria is an excellent surface choice for a wide variety of uses, including kitchen countertops, bathroom vanities, shower and tub surrounds, furniture tabletops and accent pieces, fireplace surrounds, desk tops, wet bar areas, and window sills. if you’re interested in Cambria for your countertops, or any of the other many brands we carry, contact Custom Kitchens and one of our friendly sales staff will be happy to help!